LASC > News > News: End the Relationship Between Dundalk F.C. and Fyffes and Protect Workers’ Rights! News: End the Relationship Between Dundalk F.C. and Fyffes and Protect Workers’ Rights! Click here to sign our petition. Dundalk F.C., holding a moral responsibility as sponsorship partners of Fyffes, to demand that Fyffes respect worker’s rights to join an independent trade union and for unions to engage in collective bargaining. Supporters of Dundalk F.C. to join us in boycotting all Fyffes branded Dundalk F.C. merchandise. Dundalk F.C. 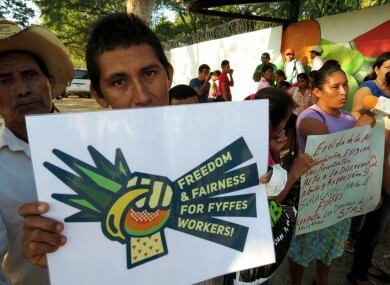 to terminate their partnership with Fyffes should they fail to engage with trade unions to resolve outstanding issues of health and safety, unpaid wages and collective bargaining rights at plantations in Honduras within the 90-day deadline set down by the ETI. News: Stop Human Rights Violations in Honduras! Error: Error validating access token: Session has expired on Monday, 11-Feb-19 08:02:55 PST. The current time is Wednesday, 24-Apr-19 04:31:07 PDT.